Maritime Folknet have collaborated with the City of Seattle Department of Neighborhoods to bring you a FREE community evening including your favourite and mine, The Whateverly Brothers! Free – Please bring a potluck dish to share with neighbors and CANNED AND PACKAGED DONATIONS FOR THE BALLARD FOOD BANK. 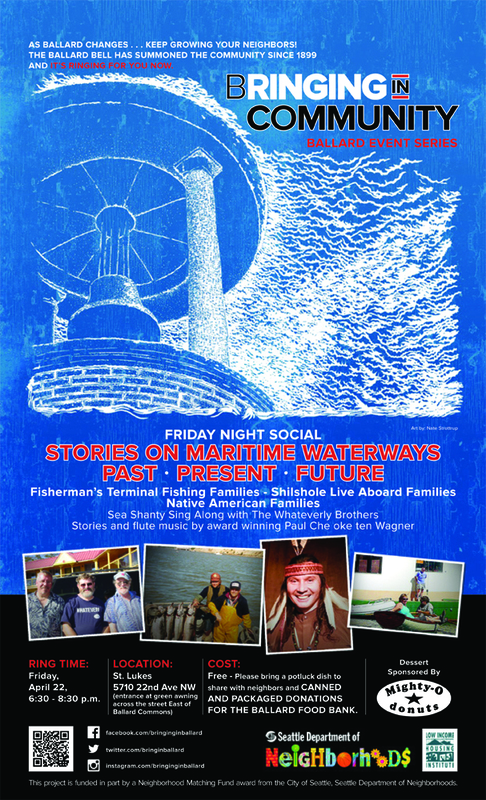 At this event in April, we are looking to celebrate the past and present of our maritime culture – beginning with the First People of our area – then broadening to look at the Scandinavian and fishing fleet families from the Fisherman’s Terminal to the Shilshole sailing crews and live aboard community. 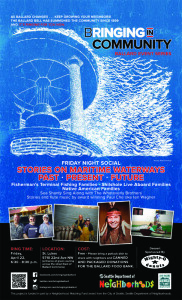 Bringing in Ballard is a series of events funded in part by the City of Seattle Department of Neighborhoods. With all of the astounding growth change we are experiencing in Ballard – there has been some challenging adjustment in the community. We are working as a team of community members to coordinate 6 events throughout this year to bring the community together and celebrate – with focus – on the wonderful past and present we share within the Ballard community.